As the Church prepares to celebrate her birthday – the great Feast of Pentecost, here are a few of my favorite quotes and prayers. Please feel free to pin and share on Social Media (of course, tell ’em where you got ’em). 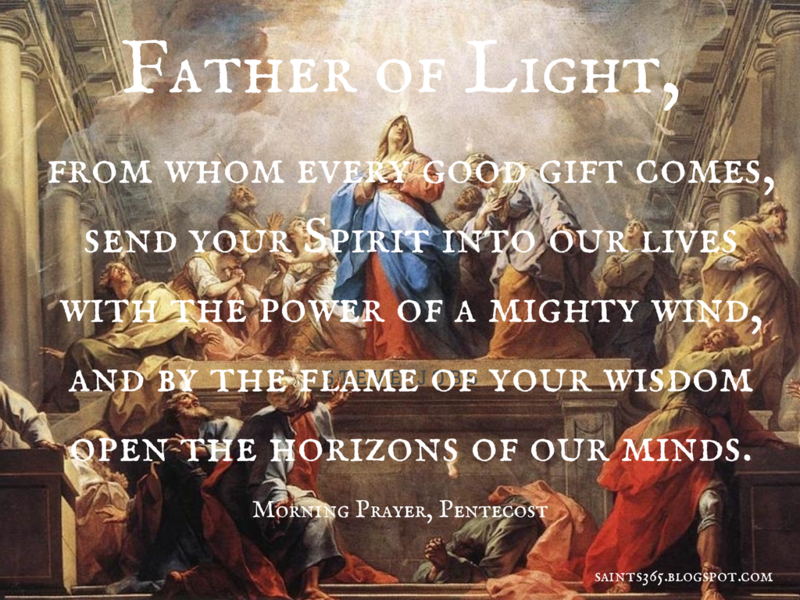 -1-This quote is the opening portion of a beautiful prayer to be recited during the Liturgy of the Hours, Morning Prayer on the Solemnity of Pentecost. The line “with the power of a mighty wind” has always given me pause. By inviting the Holy Spirit into our lives, things will never be the same. A mighty wind’s power transforms the landscape in ways that cannot be imagined in advance. This Pentecost, let us ask the Father to send the Spirit to transform our lives according to his good plan! -2-I love these next three quotes from Blessed Pope Paul VI, Saint Pope John Paul II and most recently, Pope Francis. They all speak of the fact that Pentecost needs to be an on-going reality in the life of each individual Christian and the life of the church as a whole. -3–4–5-Father Raniero Cantalamessa is one of my favorite teachers, especially when it comes to the Holy Spirit. This quote comes from his book: “Sober Intoxication of the Spirit: Part Two.” My prayer is often to ask the Holy Spirit to renew my heart and continue to keep it as a “heart of flesh” open and docile to do God’s will. Receive new posts directly via email. Sign up for free today by entering your email address below!